Play along with your favorite popular and traditional Christmas songs. Arranged specifically for the Level 1 player, this book comes with a play-along CD which includes a backing and performance track for each title. An optional piano accompaniment book is available for wind instruments. 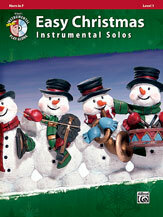 Titles: Believe * Dance of the Sugar-Plum Fairy * Deck the Hall * Feliz Navidad * The First Noel * Frosty the Snowman * Hark! The Herald Angels Sing * Jingle Bell Rock * Jingle Bells * Let It Snow! Let It Snow! Let It Snow! * The Little Drummer Boy * Silent Night * Sleigh Ride * You're a Mean One, Mr. Grinch. This title is available in SmartMusic.